It was early in the morning in Mashatu game reserve. We had been driving for about an hour. The sun was rising and it was warming up. We were driving along the Majale river in a section we had seen a large elephant herd walk through the afternoon before. By chance we stumbled upon a baby elephant carcass. Our guide, Justice, suggested that this calf must have been still-born and was probably born to one of the females in the herd we has seen the afternoon before. The fact that there were no elephants around was a tell-tale sign of what may have happened the day before. 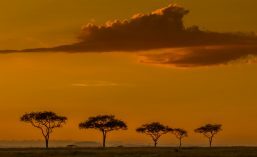 This scene was in an open area with bushes around it and a large Mashatu tree adjacent, casting deep shadow over most of the area. 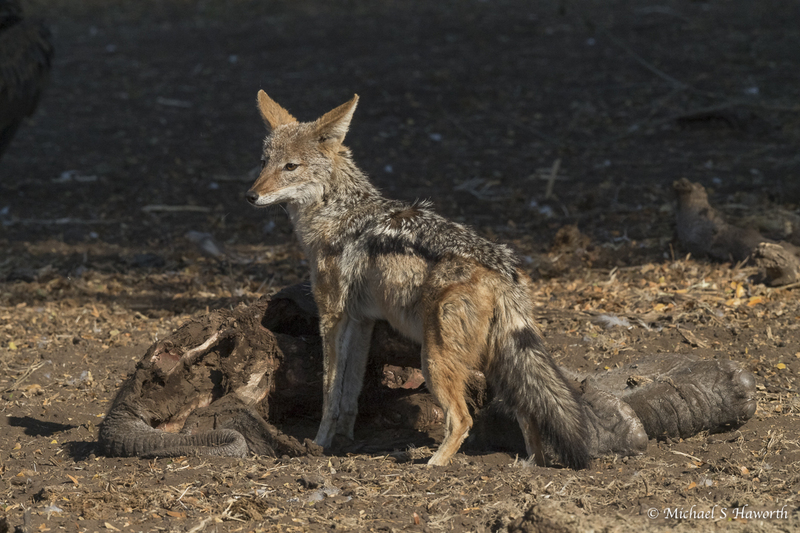 There were two pairs of black-backed jackals around the carcass which had already be partly eaten. 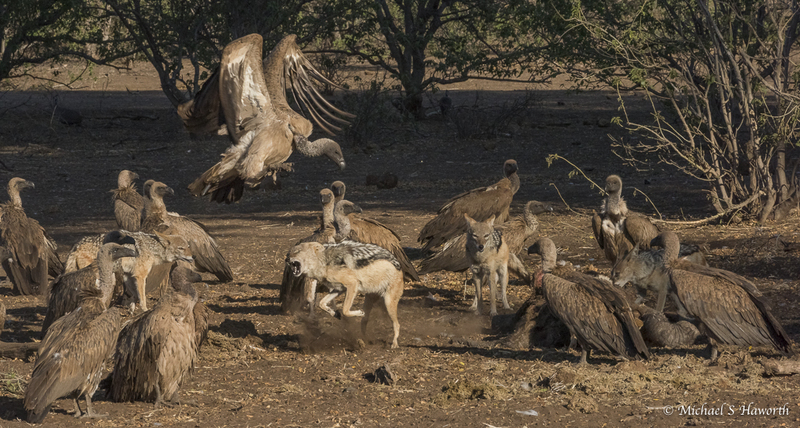 The jackals had to assert their dominance over the squadrons of vultures which were arriving. It was both interesting and amusing to watch what must have been over 50 vultures, white-backed and Cape species, flying in and out of nowhere. Before we found the carcass, we did not see any vultures in the air. We watched them arriving stacked like planes above Heathrow airport. Each vulture approached the scene differently. Some came in conventionally on finals in an orderly manner. Others tucked in their wings and came spiralling down from great height. Some came in “hot” and over shot the runway and had to fly around. The vultures have excellent eyesight and must watch each other from great distances in the sky. They are also capable of flying great distances each day. 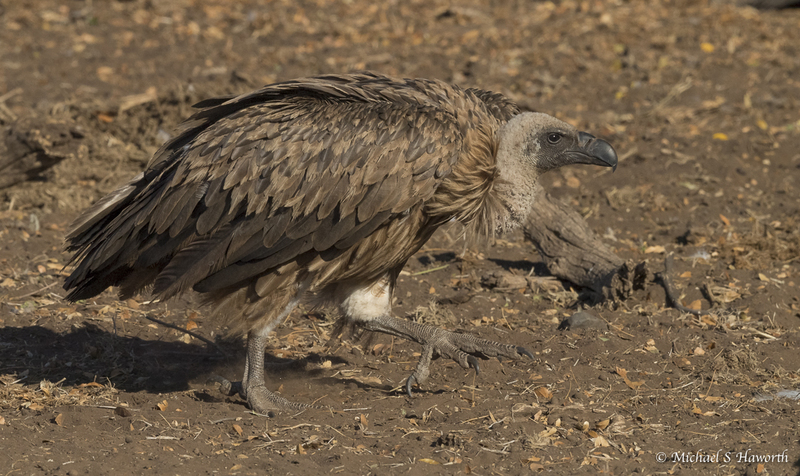 Most of the vultures which arrived were white-backed and the odd Cape vulture joined the fray. By the look of it all the flying and fighting around the carcass got too much. 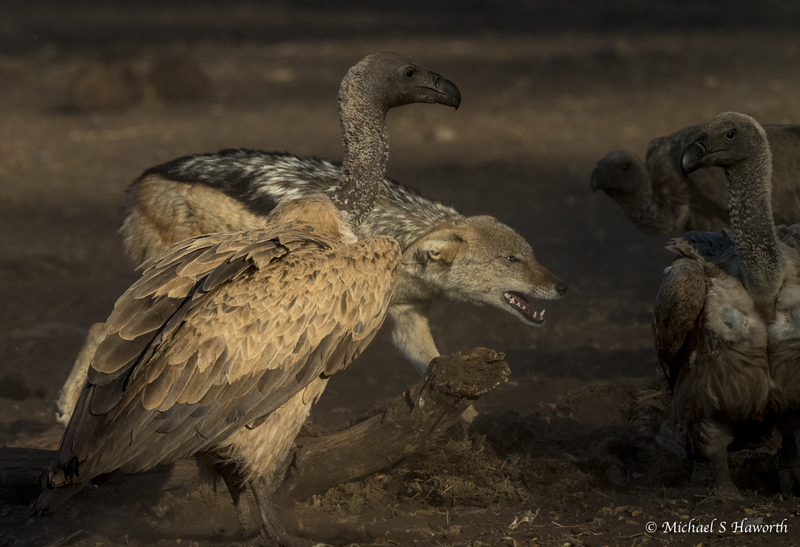 Some of the vultures chose to wait in the periphery while the jackals were having their fill. 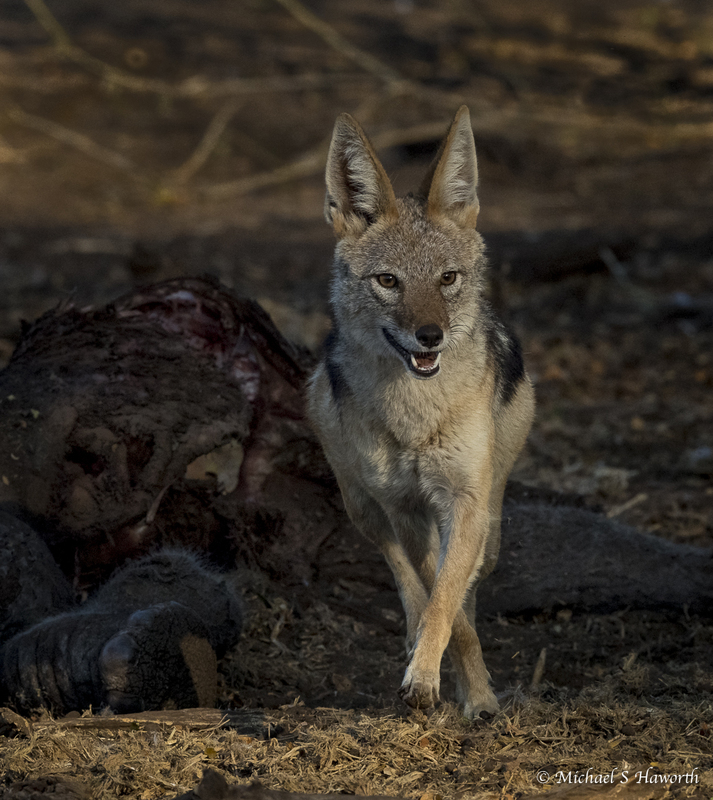 The jackals were very wary while feeding, looking beyond the vultures for possible (arriving) hyaenas and lions. 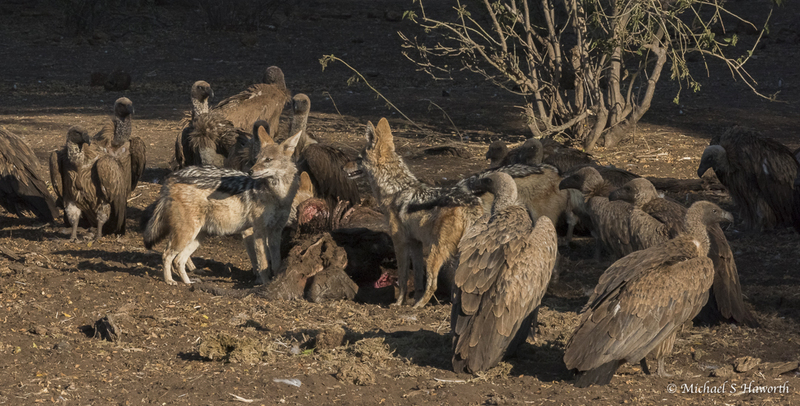 The jackals would clear space for themselves to feed on the carcass for a while and eventually the mob of vultures would crowd in on the jackals. Sometimes the jackals and vultures gave each other a fright and everyone scattered with leaves, dust and feathers flying. 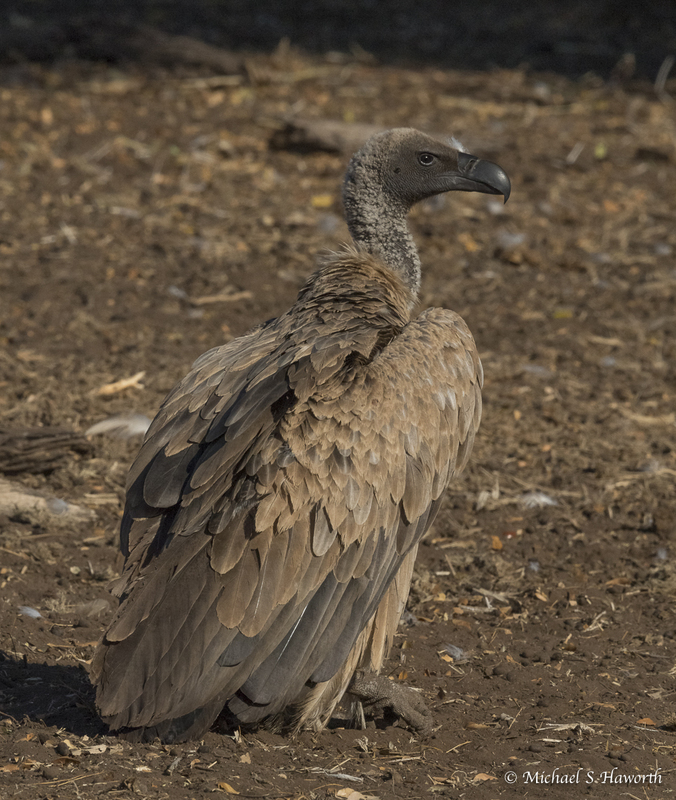 The White-backed vulture is a large bird but smaller than a Cape vulture. 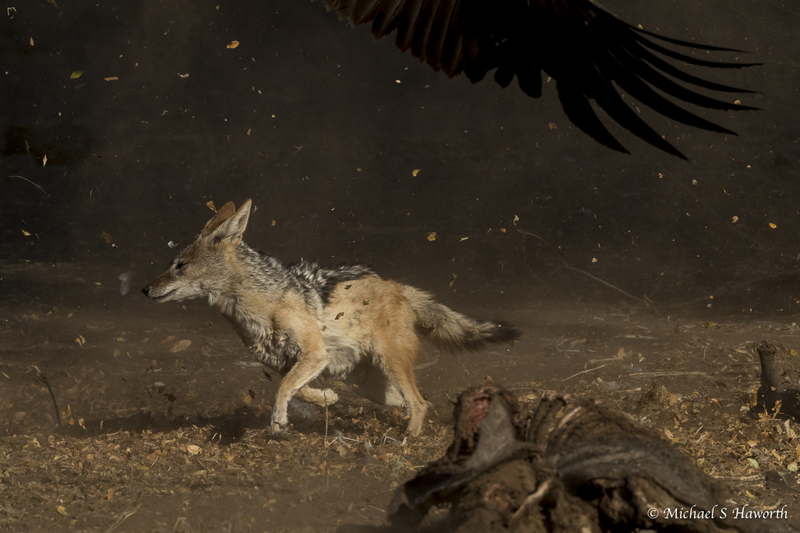 Despite their size and numbers, the jackals would take the vultures on for position at the carcass. It did not happen often but there were brief spells when the jackals had the carcass to themselves. Each jackal would eat quickly then look up to ensure that a hyaena or lion was not about to spoil the party. 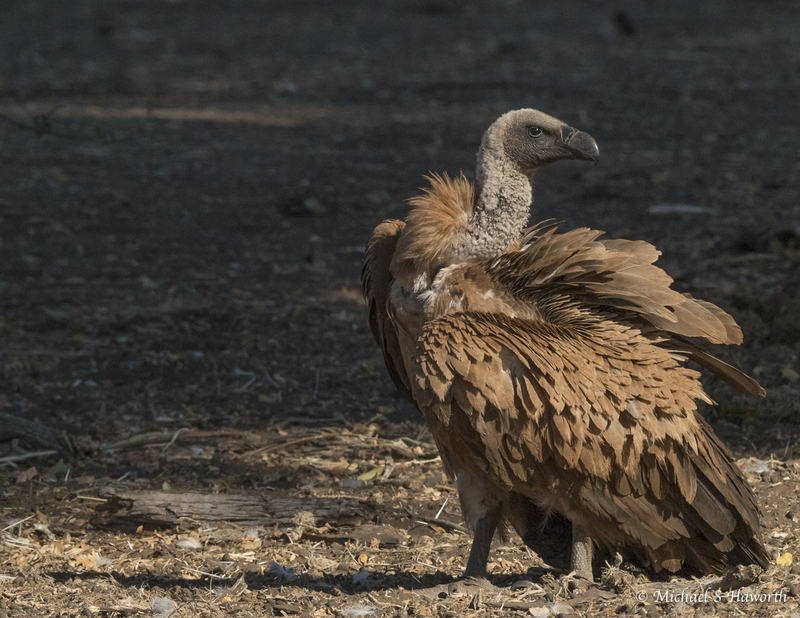 Inevitably the number of vultures arriving would signal to both hyaenas and lions that there was food around which could be stolen. 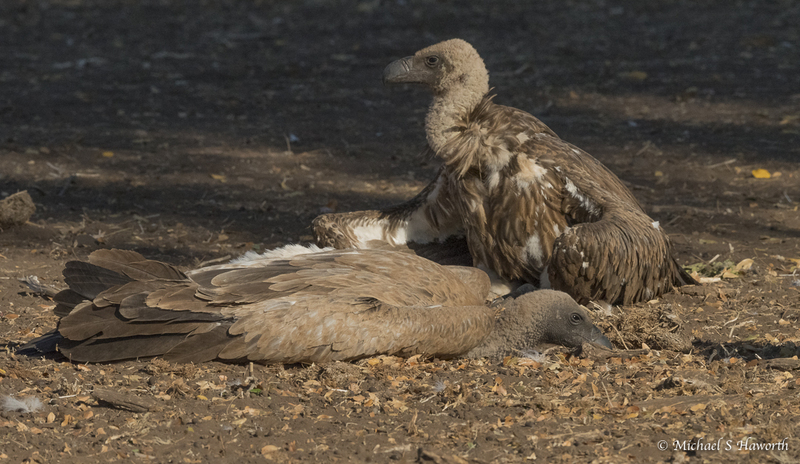 The Cape vulture is noticeably bigger than its White-backed cousin. It is also more aggressive. 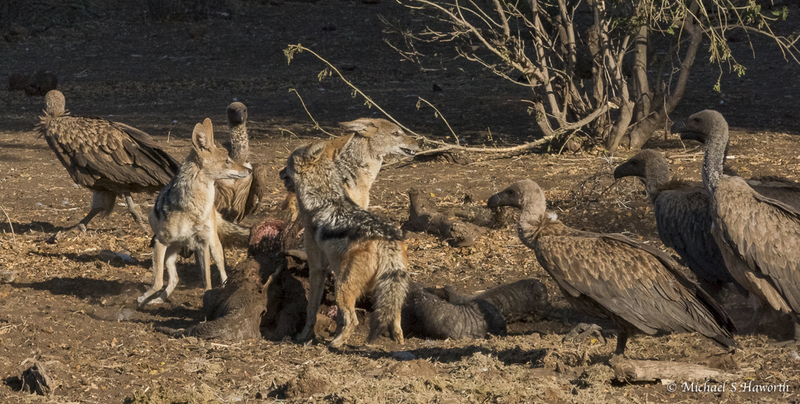 This next image show that the jackals did not have breakfast all their own way and a single jackal would be chased off the carcass by the mass of vultures. Once there were three or four jackals they won back the carcass but there was also rivalry between the pairs of jackals. 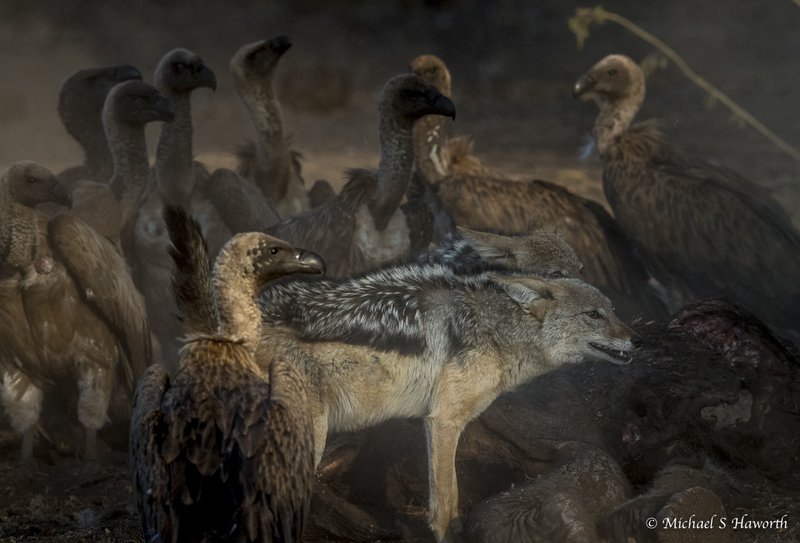 With all the noise of the vultures it must have been difficult for the jackals to hear any approaching predators so they frequently looked up in between snatching pieces of meat off the carcass. 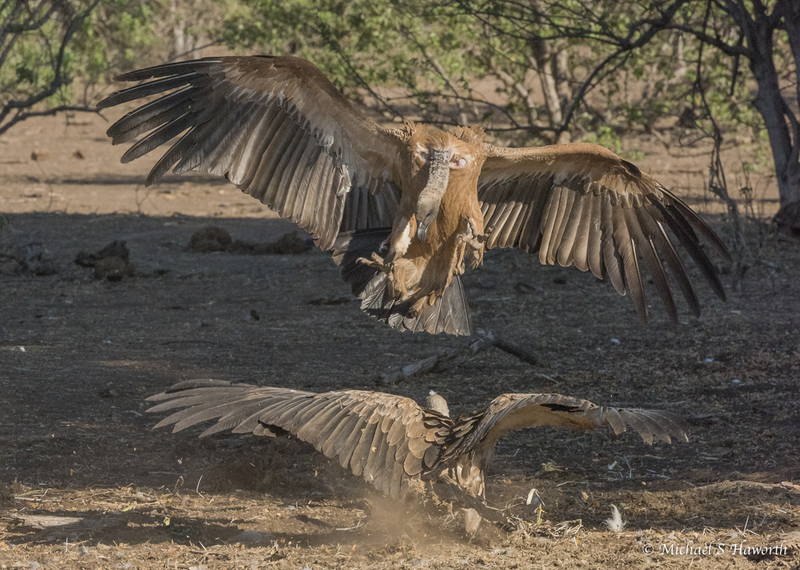 The vultures were aggressive to each other with numerous spats for dominance. 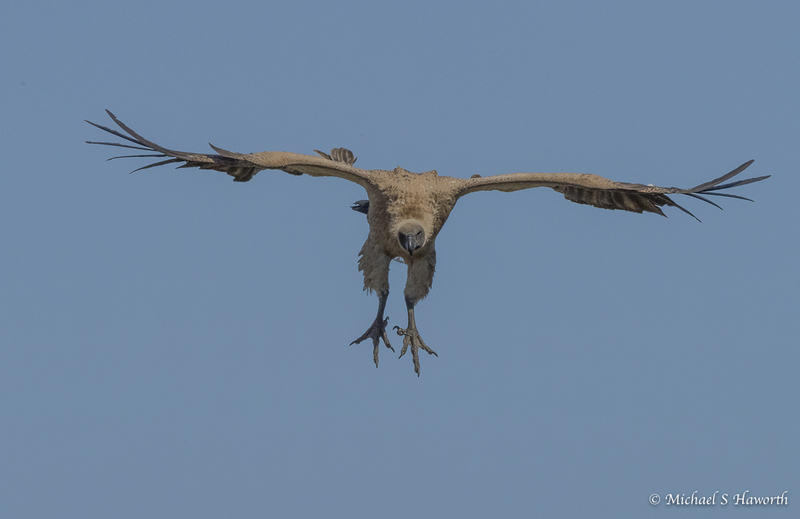 Surprisingly, in what appeared to be aggressive fights I did not see any vulture draw blood on another vulture. Once the jackals had their fill they left the scene. 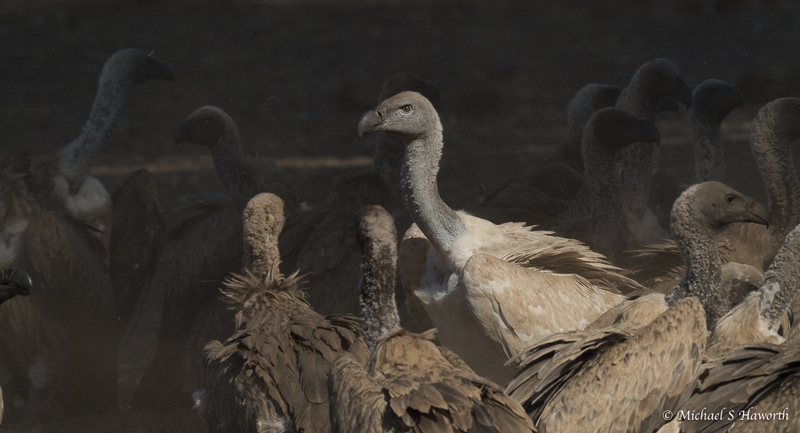 The risk of staying around was too high once the incoming vultures had signalled to all the predators in the area that there was a carcass available. 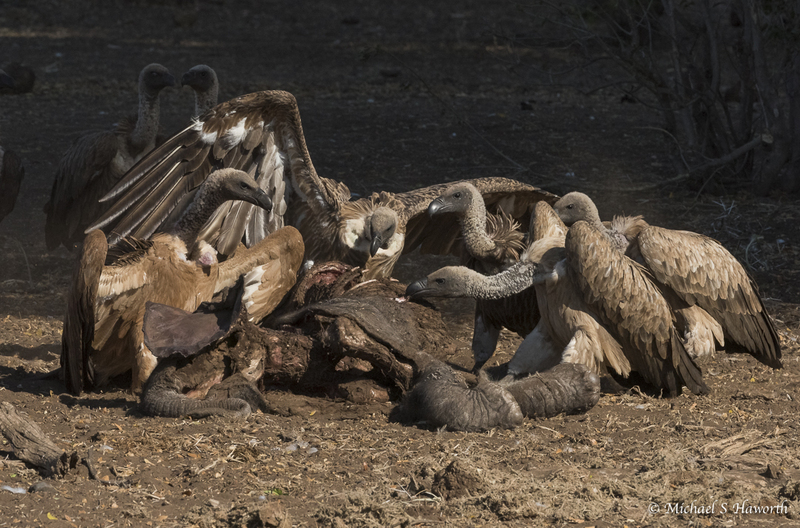 Once the vultures get stuck in they can strip a carcass very quickly. Despite all the noise and activity, we did not see one other predator come in to challenge the vultures and jackals. The vultures were coming into the feeding scene and in doing so would cast a shadow as they flew in. 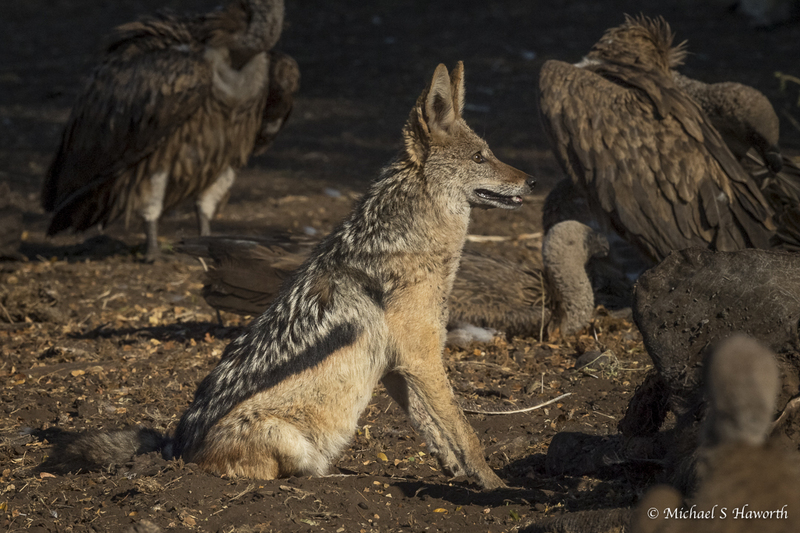 The large shadow cast by the incoming vulture caused the jackals to look up and see what was going on. Although unfortunate that the elephant calf had died, it was fascinating to watch nature’s actors perform in this scene. It was spell binding and we hardly noticed the two hours which flew by. 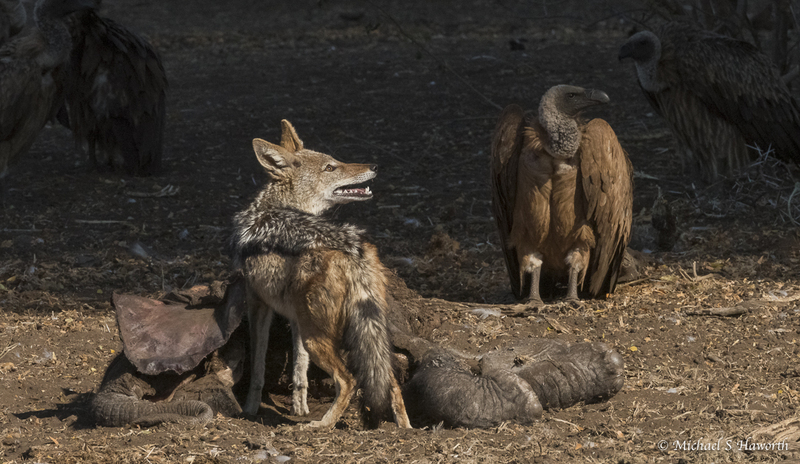 Usually I have seen lions or hyaenas dominate the scene but never seen this to and fro interaction between jackals and vultures. We never got back to this scene again but I have no doubt that there was nothing left after two or three days after natures’ waste disposal teams of hyaena, jackals and vultures had finished. It is a privilege to watch nature at work. We had a similar sighting in Namibia a couple of years ago, the difference being that it was a hyena that had dragged a kudu carcass out from a waterhole. The show that the vultures gave us was terrific.